Denon media players are intended for use as a source of music, installed in venues such as bars, restaurants, offices, fitness studios and houses of worship. Stereo or mono MP3 or WAV audio files can be played from a removable SD or SDHC card or from external USB media. Infra-red remote controls are included, so the players can be operated from a distance of up to 10 metres as an alternative to the controls on the front panel. Denon DN-F350 can play MP3 and WAV audio content from SD/SDHC, USB/HDD, and external audio device via 3.5mm jack input. In addition it can connect to external devices via Bluetooth for audio playback. DN-F350 offers a single combination socket, XLR plus 6.35mm jack, for microphone or line input. The XLR can be supplied with +48V phantom power may be switched for microphones requiring it. The signal from this socket does not pass to the headphone output, but can be routed through the main balanced XLR and unbalanced RCA phono outputs on the rear of the unit. An auto ducking function can be used to reduce the volume of the audio source when an input signal on the microphone channel is sensed. Along with large multi-function display that displays information including elapsed or remaining track-time, track or file-name, folder and track numbers, play-back mode, pitch percentage, and track BPM, the front panel also gives access to USB socket, SD card slot, 6.35mm headphone socket and a host of transport buttons, rotary controllers and switches. Audio files including MP3, WAV, FLAC, MP2, M4A, WMA, AIFF can be played directly from a USB device or SD card by using the included infrared remote control or transport section on the front panel. A rotary control for 'pitch/tempo' alters playback by +/-15% pitch or tempo, with a pitch/tempo selection toggle button allowing access to either of the adjustments. The 'pitch/tempo' adjustment is applicable to SD, AUX, USB, Bluetooth and mic/line inputs. Alternatively the user can operate pitch bend or tempo temporarily by using 'Pitch Bend' plus and minus buttons. A single IEC mains AC power input (110 to 240V, 50 to 60Hz) can be found on the rear panel along with balanced and unbalanced outputs, Bluetooth receiver, and second USB input with switch. This USB input can be set to 'normal' to allow connection to an external USB drive for audio playback, or to 'update' when a connection is required to update firmware. Playback file formats: WAV, 44.1kHz, 16-bit; MP3, 44.1kHz, from 64 to 320kbit/s; FLAC; MP2; M4A, without DRM protection; WMA, without DRM protection; AIFF. Frequency response: 20Hz to 20kHz, +/-1dB. Signal to noise: over 90dB, A-weighted. Dimensions (WxDxH): 482 x 43.6 x 200mm, 1U. Weight: 2.3kg. Included accessories: AC power cable, infrared remote control, user guide, safety and warranty manual. 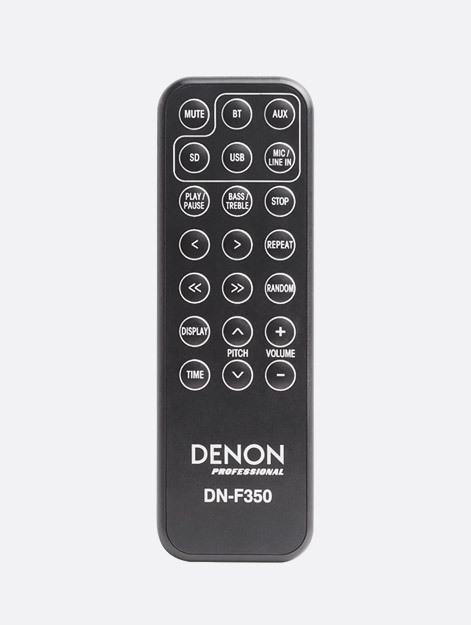 Like the Denon DN-F350, the DN-350MP has been designed for the playback of multimedia however it has an integrated 60W amplifier that supports 4 ohm, 70V and 100V line speaker systems. Audio playback can be from auxiliary input, USB port for flash drive or HDD, or connected Bluetooth device, with an internal memory to store up to eight Bluetooth devices. The front panel houses the on/off power switch and multi-function display as well as 3.5mm jack socket for auxiliary input, and transport buttons. A USB flash drive input and separate 5V, 2.1A USB charging port are also located on the front facing panel of this 1U rack-mountable media player. A 'Smartphone Shelf' gives the user a convenient place to store their smartphone or similar device. The rear of the unit hosts all output connectivity and mains IEC input. A single BNC connecter allows the user to attach the included Bluetooth antenna for better signal reception. Dual unbalanced RCA (phono) outputs link any audio inputs to an external device such as Hi-Fi or powered monitors. Two balanced 3-pin XLR output connectors offer the same routing for links to compatible devices. A rotary output level control allows adjustment of the output level; a switch allows the user to switch the amplifier section on or off. Output for either 4 ohm, 70V, or 100V speaker setup is via Euroblock (Phoenix style detachable terminal block) connection. Playback file formats: WAV, up to 48kHz, 16-bit; MP3, up to 44.1kHz, 320kbit/s; WMA, 44.1-48kHz, up to 192kbit/s. Frequency response: 10Hz to 20kHz, +/-1dB. Signal to noise: 0dB, 1kHz, A-weighted. Dimensions (WxDxH): 483 x 44 x 347mm, 1U. Weight: 4.1kg. Included accessories: AC mains power cable, remote Bluetooth antenna, infra red remote control, rackmount ears, Euroblock connector, user guide, safety and warranty manual.